As part of our ongoing personal and professional development programs, GUSTO POWER® offers periodic opportunities to participate in seminars, workshops, and other events. To view Gilat Ben-Dor’s AUTHOR EVENTS, click here. This exclusive program is available to a limited number of serious, motivated participants. What is it worth to you to finally break free of your self-defeating patterns, and to get to the business of achieving your potential? Those who are successful are swift and confident with their decisions. If you are ready to make true headway and cut through the frustration, this is your program — and this is your year! 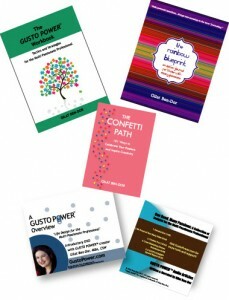 *A SIGNED copy of each of Gilat Ben-Dor’s 3 newest publications: The Confetti Path, The Rainbow Blueprint Action Journal, and The GUSTO POWER® Workbook: Tactics and Strategies for the Multi-Passionate Professional™. Details will be emailed to participants who register. Space not guaranteed until registration is complete, so Register Now. Don’t let your brilliant potential fall by the wayside as time passes you by!